Two houses are all that remain standing on the street with no name in western Mosul, just blocks from the front lines of the battle to retake Iraq's second-largest city from the Islamic State group. The once-bustling neighborhood has been reduced to rubble, its sidewalks piled high with a jumble of concrete, bricks and metal. Standing amid the debris of what was once his home on the newly liberated street, Maan Nawaf blamed IS for the destruction around him. It was IS fighters, he said, who drew the devastating firepower of the Iraqi and coalition warplanes to the street by positioning snipers on top of the buildings after ordering residents to leave, including his elderly mother. "We said we have a disabled woman, she can't walk. They said if you don't go, we will kill you," he said. The family knew the militants would make good on the threat: IS fighters killed two of his brothers, one of whom was a policeman, as well as his nephew, Nawaf said. 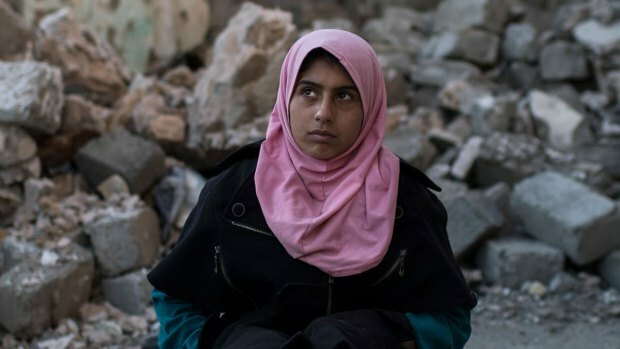 Thirteen-year-old Amna Mahmoud Alo cannot sleep and spends her days in a tranquilizer-induced calm, as fighting in her home of Mosul, Iraq, has left her emotionally shattered. Amna and her father, Mahmoud Alo, returned to their now-empty street in Mosul in April, 2017, after an Iraqi-led coalition retook their neighborhood from IS fighters. "She had strong, strong, strong memory. She doesn't have it any more. Whatever you ask, she just says 'no'," said Alo of his daughter. For the few residents who remain in Mosul's Wadi Hajar neighborhood, the war is far from over. Just blocks away, police units fired mortars at IS positions and helicopters circled overhead, firing into the streets below. IS returned fire only sporadically, the treacherous calm luring the residents into the street between the crashes of mortars. Iraqi forces backed by U.S.-led coalition airstrikes launched their assault on western Mosul in mid-February after taking the eastern sector of the city in more than three months of heavy fighting. While nearly two months of house-to-house battles have flushed the militants out of parts of the city's western sector, fighting rages nearby. Food remains a problem. Few aid trucks reach the area and food distribution can descend into chaos. Among those who managed to grab a parcel at a recent distribution was Firas Mohammed al-Jibouri. Taking it home with his young son, he opened it in his living room to find a packet of baby milk, bulgur and two bottles of oil. There was also some sugar and wheat. "It's just enough for one day. We are 25 people here — 25. Just one day," he said, looking forlornly at the small pile of provisions. A former truck driver, Jibouri has lost his livelihood: His house is one of the two still standing but his truck is gone. Any vehicles that survived the airstrikes were used for barricades or destroyed by advancing Iraqi forces fearful of car bombs. Out in the street, Jibouri pointed at individual piles of rubble and recalled those who were killed there, many of them members of his extended family. One pile used to be the Khaled Ibn al-Waleed mosque, the centerpiece of the neighborhood. Jibouri said 43 people were killed there two months ago when it was hit by back-to-back airstrikes, the second striking as people were trying to dig out the victims of the first. Surrounding one of the damaged trucks, a group of men and boys worked to remove a valuable intact wheel. One child rolled it away, and it wobbled away from him into a puddle of mud. As he struggled to lift it, a man and his young daughter sat silently in front of their house. Mahmoud Alo said the only thing he hears from his daughter, Amna, these days is a brief yes or no. Clearly traumatized by the violence around her, she has been sleeping little and spends her days staring into space. As gunfire reverberated nearby, drowning out her father's words, Amna looked around nervously at a helicopter rocketing an IS position. "Whatever you ask her, she just says 'No.' Come — she doesn't come. Bring this — she doesn't understand," her father said. He took her to a makeshift clinic, but the only thing the medics could do was give them some tranquillizers. With no immediate hope of further treatment and the war still raging around her, Amna sits sedated, and just stares. At the other end of the street, al-Jibouri finished recounting all the death and destruction that has visited his neighborhood, trying to measure the cost of his new-found freedom from IS. "It's a tragedy," he concluded.